The Cubs have been lucky in this regard. They won't maintain a .248 BABIP. But, they've been lucky in much the same way that Leonardo DiCaprio is lucky to spend a weekend on a yacht with a bevy of bikini-clad women. One of the main culprits denying opposing teams of hits is the Cubs' defense. It's been fantastic. There are a number of elite defensive players on this team. The one major eyesore defensively is Jorge Soler. The Cubs have mitigated his negative impact defensively, though, either by having him DH in AL parks (the few times that's been an option), replacing him with a better defender late in games, or just not playing him. Tommy Le Stella is another player that isn't exactly a wizard with the glove, though he only plays on a part-time basis. The majority of everyday players are well-above average defenders. The two most reliable defensive statistics we have at our disposal are DRS and UZR. The Cubs rank first in the majors as a team in both statistics. According to UZR, the Cubs defense has saved 24.5 runs above what an average defense would give up. This is a very significant amount. We're talking about a run every other game. To put it in context, if the Cubs had simply an average defense, and we tacked on 24 runs given up, the Cubs' run differential would be a meager +109. Wait, maybe that's not the best example. I'll try again. Let's look at those 24 runs in the context of offensive runs, which is much easier to grasp. Take the White Sox and their putrid offense as an example. The White Sox have scored 212 runs on the season, which ranks 19th in MLB. Tack on 24 runs and they would rank 9th in baseball in runs scored. But, enough about the Cubs' defense. This is supposed to be about their ability to induce weak contact. And the defense only takes us part of the way there in explaining the low BABIP. When we talk about "weak" contact, what specifically are we talking about? It's hard to define, exactly, but much like Potter Stewart, "I know it when I see it." Ground balls certainly qualify. They don't do much damage. They are often hit softly. But, sometimes a ground ball isn't so weak. And ground balls do get through the infield a lot. As a whole, BABIP on ground balls is actually higher than the BABIP on fly balls. But ground balls mostly go for singles. Really when we talk about weak contact, we mean avoiding hard, dangerous contact. And the Cubs have mastered the craft of avoiding hard, dangerous contact. Cubs pitchers get ground balls 49.1% of the time a ball is put in play. This is the second-highest mark in the majors. The Cubs also only give up line drives 18.4% of the time. This is the second-lowest in the league. The leftover stat is fly ball%; the Cubs' 32.4% is seventh-lowest. The main concern with giving up hard contact is that sometimes when a ball is hit hard, it will fly over the fence for a home run. Clearly, that is not an optimal outcome. Thankfully, the Cubs' HR/9 of 0.75 is the lowest in the league. This has been achieved by not giving up many fly balls and also holding the fourth-lowest HR/FB total in the league at 10.0%. They don't usually get beat with the long ball. Fangraphs measures contact and puts batted balls into three categories: soft-hit, medium-hit, and hard-hit. Cubs pitchers have the second highest soft-hit% in the league at 22.0%. They also have they fifth-lowest mark in hard-hit% at 28.2%. Also from Fangraphs, hitters have a Pull% of 37.7% against Cubs pitching. This is the seventh-lowest amount in the league. This doesn't mean much, compared to the previous statistics. But, it appears that hitters have a hard time turning on pitches from Cubs pitchers. This stuff is a little subjective, though. Someone is watching each batted ball and dropping them into a bucket. Often the difference between something categorized as weak contact and medium contact is negligible. Luckily, we can turn to Statcast to help us out. This might give us a better idea of what is going on. There is a veritable treasure trove of Statcast data available at the wonderful baseballsavant.com, which is under the umbrella of mlb.com. Its proprietor, Daren Willman is also a great twitter follow @darenw. Let's dig in. First off, an introduction. What we've learned from Statcast so far. Well, there's a lot. We'll start off with this chart, from Mr. Willman, measuring the batting average on balls based on their exit velocities from last year. Good things happen when you hit the ball hard, specifically when you start getting above 100 mph. 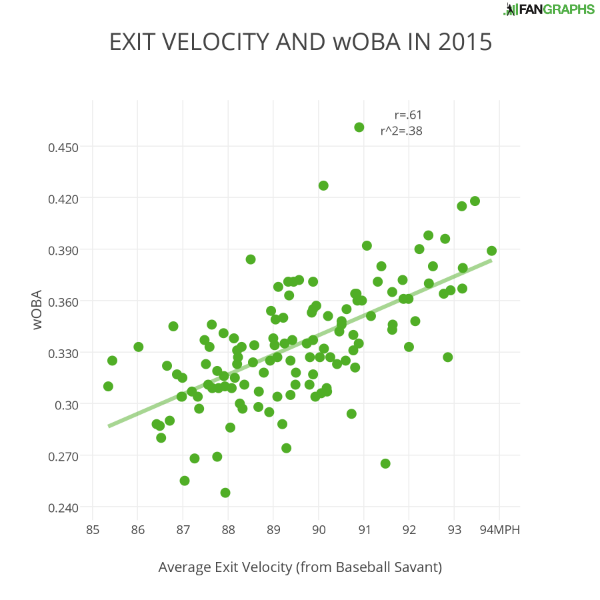 Here's another chart, from Fangraphs, showing the correlation between average exit velocity and wOBA. It's not all about exit velocity, though. The new talk of the town is launch angle. And with good reason, as you can see from this chart from 538. When you combine good exit velocity with a proper launch angle, that's when things really start clicking. This is when balls start leaving the park. 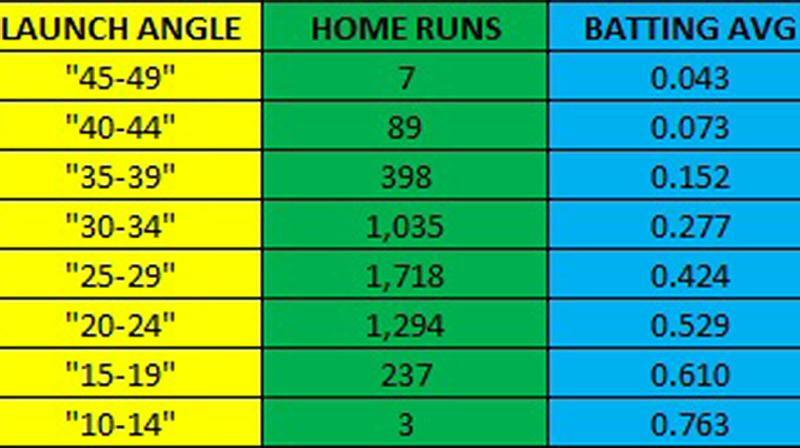 This chart from last year, from Willman, shows where the homers are coming from. Right around 20-35° is the sweet spot. So now we all have at least a decent understanding of what we are looking for in this data. There is some weird stuff that happens when studying exit velocity and launch angle. Like, in the first chart above, the batting average goes up and down, through peaks and valleys, before you get up to the large velocities. This is due to a number of things, like fielder positioning. Sometimes it is better to hit a ball softly and watch it fall in for a hit than to hit it a little bit harder, where it can carry to a fielder. Ground balls are the same. It's better to hit it really weakly on the ground and make the fielder charge the ball and make a play than it is to bounce a routine grounder to him. Though, things also work a little different for guys with differing speed. But, let's not worry too much about that weird stuff. Either way, the Cubs do a really good job of turning weaker contact into outs. As we saw in one of the charts above, anything with a launch angle of 10° or lower is probably going to be a grounder. The Cubs rank first in the majors by holding opponents to a .244 BABIP on anything hit with less than a 10° launch angle. It helps to have guys like Addison Russell playing on your infield. I know I said we were going to forget about our defense, but a lot of this stuff goes hand-in-hand. Let's focus instead on the loud, dangerous contact. We'll start off looking at things on a player-by-player basis. We've established a solid baseline for where the majority of the dangerous contact is at: between 20-35° launch angle, where nearly 90% of home runs lay, and at exit velocities of at least 100 mph, where 95% of home runs lay. I'm going to set the minimum number of pitches thrown for these searches at 750. That weeds out all of the relievers, where there is going to be a ton of noise, and leaves us with basically only qualified starters. There are 120 pitchers total in this group. Where do the Cubs pitchers rank among this group in terms of fewest total % of pitches thrown that are hit at least 100 mph and at a launch angle between 20-35°? 6) Arrieta 10) Hendricks 19) Lester 32) Lackey 53) Hammel. A good rule-of-thumb with a stat is probably to look at where Clayton Kershaw ranks. If he's not good at it, then it's probably a bad stat. He sits 8th. The inverse might be true for Shelby Miller this year. And he ranks dead last at 120. That looks good. Our guys have done a good job avoiding giving up contact in that dangerous range. But it's not all-encompassing. Maybe there have been some balls hit close to 100 mph that didn't qualify. There could still be some other damage when balls are hit at those launch angles. Let's take out the 100 mph qualifier and sort by all balls hit between those launch angles. 4) Arrieta 22) Hendricks 31) Lackey 49) Hammel 66) Lester. Still pretty good. Now let's take away the launch angle and look at just the % of pitches thrown that are hit at least 100 mph. No surprise to see Kershaw second on this list. Where are the Cubs? 7) Lester 10) Arrieta 22) Hendricks 30) Lackey 86) Hammel. That's really good, except for Hammel. Let's take a little detour for a second and talk about Hammel. The results have been great for him this season. He ranks fourth among qualified starters in the major leagues in ERA at 2.09. There's some stuff not going so great. He is walking more guys -- up from a 5.6% BB% last year to 9.7% this year. He's striking out fewer guys, but it's not that much of a disparity, and batters are actually making contact just a smidgen less than last year against him. There's a lot to like in his batted-ball profile, too. His line-drive% is down; his ground ball% is up. And his soft-hit% is up, while his hard-hit% is down. Hammel's FIP of 3.31 is 24th in the league. His xFIP is at 4.17, though, which is slightly below league average. For the uninitiated, FIP essentially is trying to look at how pitchers would do with league average success on balls-in-play and timing. It strips defense and sequencing out of the equation, and focuses instead on walks, home runs, strikeouts, and hit by pitch. xFIP is basically the same, except instead of using a pitcher's home runs given up, it gives him the league average HR/FB rate. This is why Hammel's FIP is so much lower than his xFIP. Hammel has the sixth-lowest HR/FB in the league at 5.5%. Consequently, his HR/9 of 0.48 ranks 11th in the league. But, wait, what about above when we looked at the Statcast rankings for balls hit in those danger zones? Hammel's numbers were rather pedestrian and were the worst of our five starters. Let's dig in a little deeper. 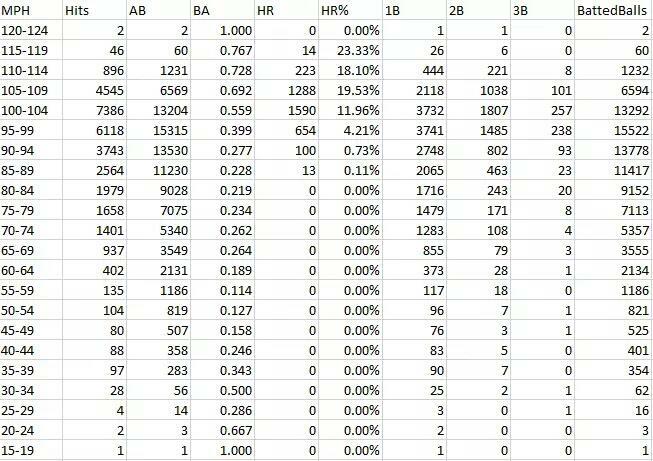 Baseballsavant shows each batted ball that fits under your chosen criteria. So let's look at the balls hit at least 100 mph with launch angles between 20-35°. Arrieta has three such occurrences. Two were home runs. The other was this spectacular catch by Jason Heyward. Hendricks has also had three such occurrences. One was a homer. One was a 403-foot double. And the other was this snazzy running snag by Dexter Fowler. Lester's had five such occurrences. Four went for home runs and one was a 391-foot fly out to Fowler. Lackey's had six of these occurrences. Four were home runs and another was a triple. The other was this catch by Fowler in the vines. These guys haven't fared very well when giving up contact in this range. Most of them are homers, and the only outs have come on what are some of the best defensive plays we've witnessed this season. Hammel's had 7 such occurrences. Three have gone for homers and four have went for doubles. The four doubles averaged 377 feet in distance. Of the four doubles, none drove in runs and only one guy later went on to score. So Hammel hasn't been hurt as bad by these types of balls in play. Of note, including the three homers, only two of these seven occurrences happened with men on base, and with a single runner on each time, at that. So Hammel very well could have been focused more on just throwing strikes, and not necessarily so much on avoiding hard contact, when these things happened. Two of them happened in the Cubs' 12-3 victory in St. Louis on May 24, after the Cubs scored 6 in the first inning. So this could lend credence to that notion. Also of note is that not all balls that fall in this threshold are the same. For instance, there is a sweet spot inside of this sweet spot. The average exit velocity on those four Hammel doubles is only 105 mph, with an average launch angle of 21.5°. Guys have just missed where the real damage is at. So Hammel does get credit for, you know, actually keeping the ball inside the park. All in all, though, the Cubs have done a good job limiting this kind of contact. Jason Hammel's probably been a little lucky, but the other guys have genuinely been pretty great in this aspect. As a team, on the % of pitches hit at least 100 mph and with a launch angle between 20-35°, the Cubs rank second. The Cubs have given up 187 total batted balls with a launch angle between 20-35° -- the fewest in the league. The next lowest is 209. The Cubs have given up the second-fewest batted balls of at least 100 mph. They've also given up the second-fewest batted balls of at least 100 mph and with a launch angle of at least 10° -- i.e., non-ground balls. The Cubs rank 24th in the league in terms of lowest average launch angle. But... but, they are a ground ball team; this doesn't make sense. Let's look, instead, at average launch angle on balls in play of only balls hit at a launch angle of at least 0°. Here the Cubs rate as the third-highest. The same can be said about our average launch angle on balls in play at a launch angle of at least 20° -- again third-highest. This is a good thing. Here, they rank up there with teams like the Royals, Angels, and Rays -- the top three teams in FB%. These teams with extreme fly ball tendencies are more effective than extreme ground-ball teams when it comes to balls hit in the air. They want you to hit the ball in the air, on a high trajectory, in order to get lazy fly outs. On balls in the air, the Cubs are getting them up at the same trajectories as these teams. Then, look at the teams on the other end of the spectrum here: the Cardinals, the Rockies (the top two teams in both GB/FB rate, according to Fangraphs, and in lowest launch angle on balls that aren't grounders), and also the Astros. These are all teams that are right there with us in GB/FB rate and ground ball%. The difference is, when their pitchers give up batted balls into the air, they are more often on a lower trajectory, like their ground balls. So, you get more line drives and home runs. The Cubs pitchers get a lot of ground balls, too. But, when they give up fly balls, they are on a higher trajectory -- thus, more lazy fly outs and fewer laser home runs and doubles. This bears out when we look at these teams' batted-ball profiles on Fangraphs. In terms of highest line drive%, the Astros, Rockies, and Cardinals rank 1st, 3rd, and 11th. The Cubs are the second lowest. In terms of HR/FB, these other three teams also rank in the top half of the league, with the Cubs the fourth-lowest. Most ground ball pitchers usually are making a mistake when they give up fly balls. Ground balls are their forte. So when a guy gets the ball in the air, it's usually not very good news for the pitcher. He probably didn't accomplish what he wanted, and the hitter probably jumped on his mistake. The Cubs are as good as they are at getting weak contact, because they are able to get weak contact on both ground balls and fly balls. It doesn't matter too much. While they would probably prefer a weak grounder, even if you get it in the air, it's probably just a lazy fly out. They also have been proficient at avoiding dangerously hit balls -- balls at a high exit velocity and at the proper launch angle. This isn't to say that this is something that will absolutely continue to be the case or anything like that. But, so far, the Cubs have been really impressive at inducing weak contact.